LENOX - "You're a potato-head," 5-year-old Roth Arun repeatedly said to his foster mother with a mischievous smile. On a recent visit to see his surgeons at Children's Hospital Boston, Arun played in the airport-like lobby, calling her names and peering into a fish tank with other children who occasionally tried to touch the stump he has in place of a left arm. 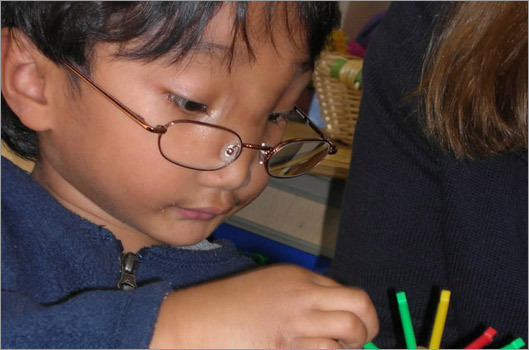 In 2004, Arun was brought to this country from a Cambodian orphanage for medical treatment at Children's. At the time, he couldn't speak or walk - and nobody knew if he ever would. A hole in the front of his skull had allowed his brain to spill into his forehead as he grew, forcing his eyes apart and his nose down. His left arm and leg had only partially formed at birth, and his single foot had only four toes. He had no olfactory glands to give him a sense of smell. His skull abnormality, called a frontoethmoidal meningoencephalocele, is rare in the West but more common in Southeast Asia. In Cambodia alone, every year approximately 75 babies are born with the problem, which has no clear cause. Doctors were worried that the surgeries needed to fix Arun's face would disrupt the accommodations his brain had made to cope with these deformities, leaving him worse off. "He was remarkably well adjusted to all these changes in the brain," said Dr. Mark Proctor, a pediatric neurosurgeon at Children's. But Proctor and the rest of the medical team proceeded with an operation to remove a piece of skull between his eyes and cut away the bulging brain tissue. They used bone from the back of his skull to patch the front. "Obviously in retrospect we're glad we did it," Proctor said. "What he had on his face was very disfiguring. It would have made it difficult for him to interact with other children normally." Ellen Loftus, of Lenox, insisted that Arun get the surgery and has cared for him ever since. "Other people would've refused to operate on him," said Dr. John Mulliken, a pediatric plastic surgeon at Children's. "But she talked us into it." Arun is one of about 250 disabled children Loftus and a friend have brought from other countries for medical treatment in the Boston area. Loftus helped raise money for their travels and care and has been foster mother to as many as 40 of the children before sending them back to their home countries to live more normal lives. But Arun and a handful of others have stayed because they needed follow-up treatment or were eligible for adoption. Now living with Loftus and her husband, Tim, in their cozy Lenox home are a 5-year-old girl from India who weighs a meager 19 pounds; an autistic Filipino boy, also 5; and a 9-year-old Korean girl who was born with a face so dramatically cleft that an eye was missing in addition to deformities of the palate and lip. Loftus's biological sons, Ryan, 21, and Kevin, 17, both still live at home. And then there's Arun - nicknamed Bucket. Arun "used to play with a bucket I had. The only thing he would play with was the bucket," said Tim, who sells and delivers snack foods, mainly potato chips and pretzels. "We had toys - he didn't want to do anything we told him to do. He was like a rebel." Everyone who knows Arun describes him as being two things: very charming and even more stubborn. While that single-minded determination may make him a handful, many also credit it for his astonishing progress. "It's got to be on Arun's terms," his physical therapist, Jamie Bannon said. Most kids with his level of disability would have pined for or simply ignored the play structure outside his public preschool. Arun considered it a challenge. Now, he climbs all over the equipment on his own and romps around the playground with the other kids. But he hasn't always approached obstacles that way. When he first got his prosthetic leg, he did not want it, "he wanted to be carried," Loftus said. "Whatever you would do for him, he would not do for himself." So she pushed. If Arun wanted something, he had to walk to get it himself. She moved his toys around so he would have to get them and even laid trails of candy for him to follow around the house. "Now, life's a challenge, and he wants to grab it," she said, adding that she has seen the same behaviors in other children from orphanages, borne of a life without a family and the rigid routine of life in an institution. "He was very mistrusting, and a lot of his charm was manipulative," she said. "But now it's a more genuine charm." Arun is about a year and a half behind his peers academically - which is remarkable, considering that he learned English as a second language without having properly absorbed Khmer as a first language. He can count to 10 and identify some written letters, but he sometimes gets lost in the day's transitions. "As he gets older and is expected to know more, you can see what the deficits are affecting," his speech language pathologist Lisa Budzek-Burr said. "I think he's in an ideal situation in preschool. Kindergarten will be a different scenario." Soon, Arun will have to sit still and pay attention for extended periods. And the coming years will pose other challenges. "Is he Einstein bright? No," Loftus said, adding that for years to come "he may need guidance. He may need supervision. We know that. It's OK."
He will also likely need more surgery, and he remains at risk for seizures and vulnerable to head injuries. But Loftus believes all the effort to bring him from Cambodia and address his disabilities was worthwhile. "If your country can't do it, does that mean you don't deserve it?" she asked. "Arun has a spirit. He needed every chance."